UNITED NATIONS, Mar 31 2016 (IPS) - “We cannot respond to refugee crises by closing doors and building fences,” said UN High Commissioner For Refugees (UNHCR) Filippo Grandi in his opening address to a high-level event in Geneva. By the end of the meeting, however, the international community remained reluctant to welcome refugees. The conference, which brought together representatives from 92 countries, along with governmental and nongovernmental organizations on 30 March, was convened by UNHCR to explore pathways for refugees and asylum-seekers to help relieve the pressure on Syria’s neighbouring countries. While highlighting the need to globally share responsibility, Grandi said it cannot be “business as usual,” leaving the burden to a handful of states. “Offering alternative avenues for the admission of Syrian refugees must become part of the solution, together with investing in helping the countries in the region,” Grandi added. The five-year conflict in the Middle Eastern nation has forced over 4.8 million civilians to flee while displacing another 6.5 million within its borders. Though many seek refuge in Europe, the majority of refugees have stayed in the region. Turkey currently hosts over 2.5 million Syrians, making it the largest refugee-hosting country. In Lebanon, a country of just four million hosting more than 1 million refugees, one in five people are Syrian. Unable to cope with the unprecedented numbers, neighboring countries have found their economic resources exhausted. 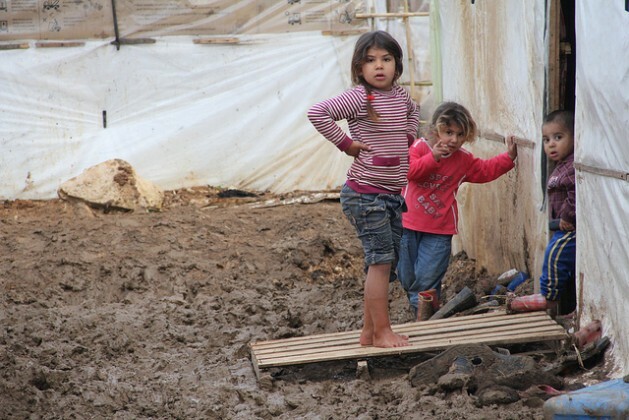 According to a UN and World Bank study, 90 percent of Syrian refugees in Jordan and Lebanon live under the national poverty line. Secretary-General Ban Ki-moon also pressed for action, noting that the world must “step up” with concrete actions, including the fulfillment of governments’ resettlement promises. Countries have so far pledged 179,000 resettlement places for Syrians. However, according to an Oxfam report, wealthy nations, which have made the majority of resettlement pledges, have only resettled 1.39 percent of all Syrian refugees. Only three countries, including Germany, Norway, and Canada, have made resettlement pledges that have surpassed their “fair share,” calculated according to the size of their economy. Canada, while working with UNHCR, was able to resettle over 26,000 Syrian refugees in less than four months. The Secretary-General and High Commissioner also urged countries to also allow other pathways for admission, including family reunification, labor mobility schemes, and student visas and scholarships. “Today, they are refugees. Tomorrow, they can be students and professors, scientists and researchers, workers and caregivers,” Ban said in his address. While speaking to delegates, Razan Ibraheem, a Syrian journalist who reached Ireland with a student visa, said she had met a woman who had taken a boat to Greece with her sister’s four children and her own five children because a family unification application had failed. “Had her application been processed, those children would have been saved the horrors of crossing the Mediterranean,” she stated. She stressed that countries must expand resettlement programmes and speed up other channels including family reunion. UNHCR has called for resettling or providing other avenues of admission for 10 percent of Syrian refugees in neighboring countries, or 480,000, over the next three years. Other organizations have followed suit, but have called for the resettlement of 10 percent by the end of 2016. Despite appeals, the conference ended with doors remaining closed on Syrian refugees. Grandi announced that countries have pledged just an additional 6,000 resettlement spaces, falling short of the refugee agency’s request. “Almost all states attending have failed to show the level of generosity required,” they continued.